Kara confronts Ivo and his M.O.N.Q.U.I.S. He slips away and gets into a giant robot monkey suit and they fight. Henry's friends search for a way out, and decide to build themselves a gun out of scraps. Lois is snooping through the university's financial records (in the university library?) and a student catches her and drops a bunch of evidence in her lap about how the university is funding immortality research and how it's connected to the missing Charlize. During the fight, Professor Ivo monologues about how he made a seed bank of the human intellect from all the smart kids he kidnapped, and he's going to fill out the rest of the information from Kara's brain. Just then Henry's friends break into the room with their makeshift guns and attack the M.O.N.Q.U.I.S. With their help, Ivo is defeated and arrested. Kara changes back to Linda and tells Henry he did a good job. 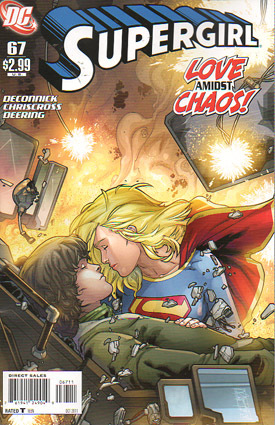 Kara (as Linda) goes to see Henry and thanks him for reminding her that there's magic in the world, then she kisses him and flies up into the air. Story - 4: The good news is the story wound up nicely, and was a lot of fun. There's a good bit of lighthearted yet realistic banter which worked really well, and you can't go wrong with a "Princess Bride" reference. No information was given on Charlize's fate though, unless I missed it somehow, and that seemed odd when it's what spurred the entire thing on. What happened to all the kids who Ivo kidnapped? Are they dead? Are they okay? What about the university funding Ivo? It was all sort of swept under the rug with the "several key arrests later" caption, and while that's humorous and made me smile, it doesn't really wrap up the loose ends effectively. One line about the kids or the university would have been enough, so I think that was a bit of a missed opportunity. I also don't buy Kara's attraction to Henry. I DO buy that she'd come back to thank him for opening her eyes, but the kiss just made no sense at all to me (which is exactly what I said to myself when I saw the cover). All that said, this was a pretty good arc. I've reviewed all 67 issues of this series, and I wish I could say I was more sad to see it go. It's been plagued with problems from the start, but at least it went out with a bang and what is probably the strongest arc this book has ever had. For what it's worth, I didn't mind the M.O.N.Q.U.I.S. here at all, as they seemed to fit right in with the more lighthearted tone. I know I was pretty harsh about them two issues ago, but perhaps I just didn't get the tonal shift the story was taking early enough. I do have one gripe, though... Lois is an investigative journalist, and a BRILLIANT one. Why did she have to get the information she wanted due to coincidence of some random student happening to catch her poking around and then just HAPPENING to have the same curiosity Lois had and dropping all the information right in her lap? Lois got caught snooping in the university president's office, too, but at least there everything she wanted wasn't dropped in her lap from above without her having anything to do with it. There's no reason Lois couldn't have learned all that information herself, and given her nice character moments in doing so. That's probably my biggest gripe here... Lois Lane doesn't need random people to drop information she needs in her lap! She goes out and finds it for herself. Art - 1: I've got nothing else to say about the art here that I have not said already. I just don't enjoy it at all. Cover Art - 3: Kind of anticlimactic for the end of the arc and book, and I still don't buy the kiss at all, but otherwise it's... adequate.